ANAHEIM, Calif. (AP) — Nick Cousins and company took a deep breath. “I just looked and there was a lot of relief. We didn’t want to go another period without scoring a goal,” Strome said. Coach Rick Tocchet also looked relieved that he didn’t have to answer any more questions about when his team was going to get its first victory. Street’s goal at 14:39 of the second period was his first in the NHL. At 31 years and 240 days, he is the oldest player to score his first NHL goal with Anaheim in the 25-year history of the franchise. NOTES: The Ducks have allowed only six goals in their first four games, which is the lowest total in franchise history. 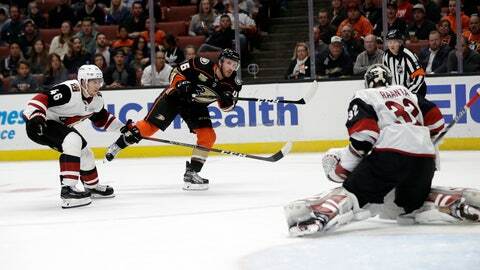 … Anaheim’s Andrew Cogliano has an assist in two straight games. … It was Arizona’s longest goal drought to open a season, more than doubling the 67:11 mark at the start of the 1996-97 season. … Two of the six goals Anaheim has allowed this season were short-handed. The Ducks and Flyers are the only teams to have allowed two so far this season. … Arizona’s Derek Stepan played in his 600th NHL game. He is the ninth player from the 2008 draft class and first non-first round pick to reach that milestone.